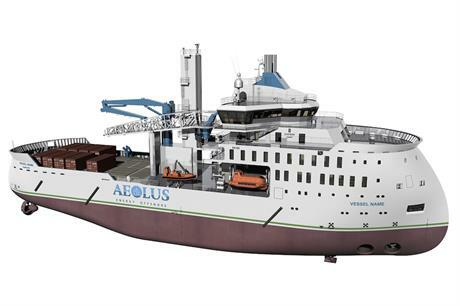 UNITED STATES: Wind service provider Aeolus Energy and Dutch shipbuilders Ulstein Design & Solutions will design a service operations vessel (SOV) for the US offshore wind sector. The design will be compliant with the US’ Jones Act, which requires that ships operating in US waters to be owned by US companies and crewed by US citizens. It will be the first vessel in Aeolus Energy’s US offshore wind fleet, which will also include jack-up vessels, cable ships, crew transfer vessels (CTVs) and hotel ships. Each of these vessels will be built in US shipyards, the Florida-based company added. It will "solicit bids from competitive US shipyards with the capability to build large, complex vessels on par with leading global construction yards", a company spokeswoman added. Aeolus Energy, which also provides operations and maintenance (O&M) services for onshore wind projects in the US, is developing port facilities necessary for the fleet’s construction in Massachusetts and Maryland. Aeolus Energy CEO Elia Golfin said: "The design and ultimate construction of these vessels will result in significant job creation and is a demonstration of confidence in the American shipbuilding industry." The company expects to complete the first vessels in 2021, and believes construction of the fleet will create more than 4,000 jobs. Meanwhile, naval architects Chartwell Marine has stressed the need for proven vessel concepts in de-risking the nascent US offshore wind sector. Managing director Andy Page explained that the US’ environmental and operational requirements, including those under the Jones Act, necessitated a "strong business case for investment". However, he added that the US’ supply chain was "well-placed" to respond to such challenges, but an "ongoing dialogue" with offshore wind developers was also needed. Boat builders should take proven vessel concepts from the European sector, refine them and apply them in the US, Page suggested. He added: "There are a multitude of risks involved in establishing a presence in a new market — particularly for a sector as technologically demanding and complex as offshore wind. "While major developers and operators have recently given US offshore wind a huge vote of confidence, their focus is squarely on risk management and de-risking vessel support will be high on the list of priorities."